Watching a 737-800 push, taxi, and takeoff is nothing unusual. For most people, it is of little interest, taken for granted. Monday morning's Alaska Airlines Flight 4 from Seattle-Tacoma International Airport to Reagan National Airport in Washington, DC. was just one more. What distinguished this flight was the fuel onboard, a blend of conventional kerosene-based Jet-A mixed with fuel extracted from a feedstock of "forest residuals," the limbs and branches left behind after harvesting of managed forests. Often burned as waste, a process developed by the Washington State University-led Northwest Advanced Renewables Alliance converts this wood material into fuel chemically indistinguishable from standard Jet-A. The biofuel is fully compliant with international ASTM Standards. The past several years have seen steady advances in aviation biofuel development, from jatropha to camelina, demonstration flights are becoming more common as the industry grapples with new international standards to reduce emissions. The 20 percent biofuel blend used for Monday's flight adapted a patented technology from Gevo, Inc., a NARA partner. The two-step process converts cellulosic sugars into isobutanol alcohol, then into Gevo's Alcohol-to-Jet (ATJ) fuel. 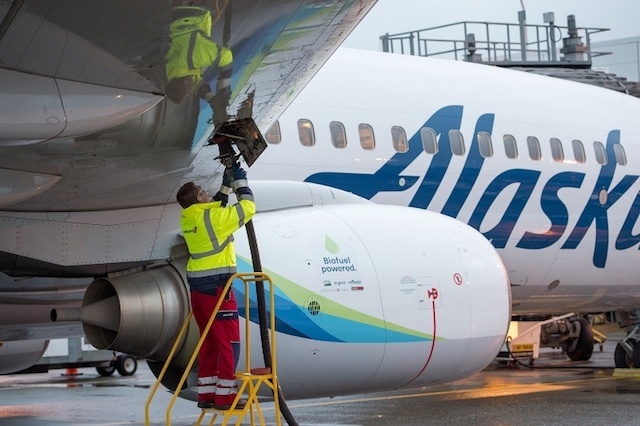 Sourced from tribal lands and private forestry operations in the region, the 1,080 gallons of biofuel used will have minimal impact on Alaska Airlines overall greenhouse gas emissions. It is only a step toward a larger objective. if the airline were able to replace 20 percent of its entire fuel supply at Sea-Tac Airport, it would reduce greenhouse gas emissions by about 142,000 metric tons of CO2. This is equivalent to taking approximately 30,000 passenger vehicles off the road for one year. From feedstock to jet fuel, the Monday's successful demonstration emphasizes the value of integrating multiple stakeholders in the research and development of emerging technologies for sustainable aviation biofuels. Flight 4 left SeaTac with 163 passengers, among them were several government officials along for the ride to help raise public awareness and cast a positive light on the possibilities of sustainable aviation biofuel. "This latest milestone in Alaska's efforts to promote sustainable biofuels is especially exciting since it is uniquely sourced from the forest residuals in the Pacific Northwest," said Joe Sprague, Alaska Airlines' senior vice president of communications and external relations. "NARA's accomplishments and the investment of the U.S. Department of Agriculture provide another key in helping Alaska Airlines and the aviation industry reduce its carbon footprint and dependency on fossil fuels," said Sprague. The project highlights the urgent need to continue and foster new partnerships for research and development among industry, government, academia and public institutions. "Today's flight comes after years of investments to help the aviation biofuels industry take off," said U.S. Senator Maria Cantwell. "By creating these sustainable biofuels, we will revitalize our rural agricultural communities, foster economic growth, reduce greenhouse gas emissions, and cut our dependence on foreign oil while growing our competitiveness in global markets." As global commercial aviation continues to expand, so does the need to reduce greenhouse gas emissions from burning typical kerosene Jet-A. Monday's biofuel test not only advances the potential of sustainable aviation biofuel but is also an example of business and industry pushing forward together toward a more sustainable economy.